First up for Music that has influenced me… is my very favourite band HIM. HIM are / were a Finnish rock band, with a career spanning over 25 years and an iconic logo of the Heartagram, found on the bodies of almost any HIM fan around the world and most notably made famous by Bam Margera. 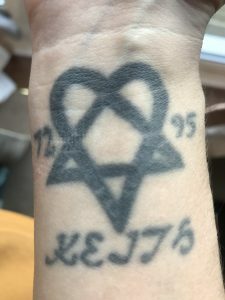 Yes I do sport a Heartagram, on my right wrist in fact and it’s been there since 2004 (I was a week away from turning 18 when I had it) more on that at a later date. Heartagram tattoo I had at 17, in memory of my brother. I discovered HIM around early 2003 maybe, at the time I was still at school and hung out mostly with a bunch of skater kids (no I can’t skate! unless face planting the floor is considered skating) one of the lads lent me a copy of Haggard a film featuring Bam Margera and Ryan Dunn, at the end of this film HIM are featured playing Heartache Every Moment. It was there my love started and I needed more than anything to know more about this band. Love Metal came out in 2003 around the time I’d just discovered HIM, from here I bought every album and have bought every album released for the last 14 years, usually opting for the limited edition versions. Love Metal holds a very special place in my heart as around this time I was really struggling with depression and self harming, brought on through loosing my older brother to suicide years previous. This album felt like it was written just for me, explaining exactly how I was feeling (along with other bands / other songs but those are for another time) Songs like Fortress of Tears, The Sacrament, Circle of Fear and Endless Dark all resonated with how hopeless I felt. 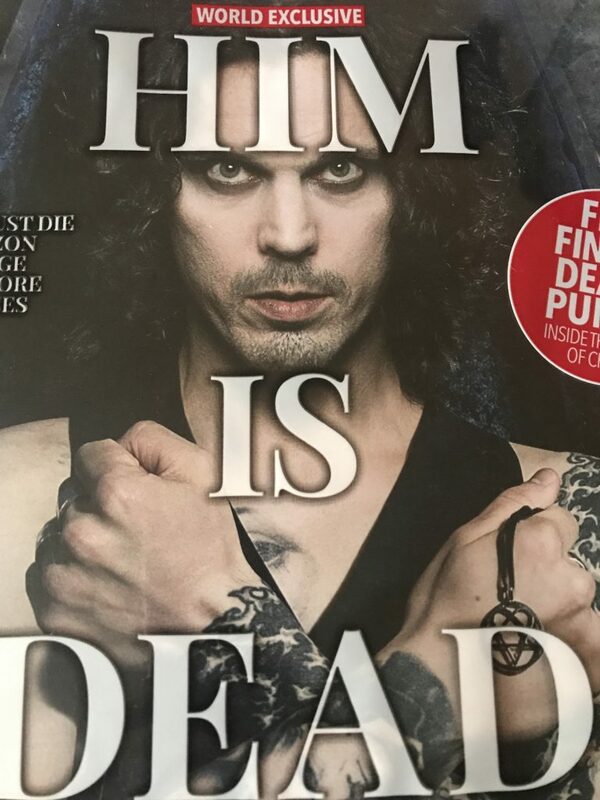 Ville’s deep melodic voice so full of sadness yet still holding on to hope, is what got me through some of the darkest moments. It’s not just the darkest moments, but some of the very best moments also have a soundtrack by HIM, they have been an underlying soundtrack to most of my “adult” life, and very much so to mine and Kris’ relationship. So it feels a little strange that there’ll be no more songs to add to that playlist. The Romantic sadness that emanates through Deep Shadows and Brilliant Highlights, still manages to carry me away to another realm, the fairytale I was looking for is buried well and truly here in any one of their albums. Ville puts so much emotion into every song that it’s palpable you can feel the emotions within his voice. I love that I can always find a song or album to fit my mood, and all bar maybe one or two songs I absolutely love every song on every album. That’s a mean feat for any band to accomplish. I’ve managed to see them on 4 occasions, first was at the old Carling Academy in Birmingham, then at the Civic Hall in Wolverhampton, at the New o2 Academy in Birmingham and then finally for their last ever tour at the Roundhouse in London. I’ll be honest I cried when I heard that they were calling time and HIM was over. Despite having the very conversation merely weeks earlier with Kris, that the whole Love Metal era felt like it had run its course, I mean you can only go over the same subject so many times before you’re coming back full circle and just re hashing it out, but still it didn’t make it hurt any less. I was so glad we managed to get tickets, I was just glad we were able to travel to London for the last date. Big thanks there for my wonderful Mum for having the kids for us, it was an insanely late night as we had to travel home to the Midlands straight after, but so worth it. They’ve done the right thing for sure, it’s an incredibly brave move to say “ok this right now is the end of this, there’s no going back, no leaving it to be picked back up, but this chapter is closed.” And I think that’s perfect I like having an ending, I’m not sitting here writing this and wondering what ever happened to them! There will be a podcast coming soon, which will go more in depth in the music that has influenced me.